The Soil Moisture Sensor accurately measures soil moisture for many applications. The sensor requires no maintenance and has Analogue Output and Digital output. The moisture gauge averages moisture through a column of soil equal to its length when placed vertically, or will measure moisture at a specific soil depth when placed horizontally. Soil moisture module is sensitive to the ambient humidity and is generally used to detect the moisture content of soil. The Digital Out port will set to high when the soil humidity exceeds a set threshold value. 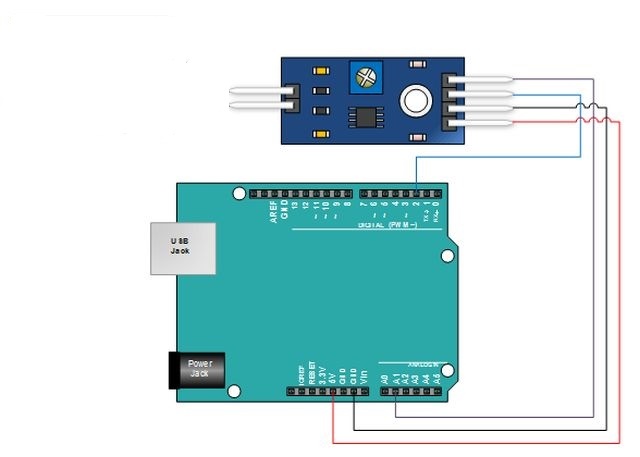 The digital output can be connected directly to an Arduino to detect high and low by the microcontroller to detect soil moisture. The digital outputs DO can directly drive the buzzer module, which can be used as a soil moisture alarm equipment. Analog output AO and AD module connected through the AD converter. •	This is a simple water sensor, can be used to detect soil moisture .Module Output is high level when the soil moisture deficit, or output is low. Can be used in module plant watering device, and the plants in your garden no need people to manage. •	Adjustable sensitivity by adjusting the digital potentiometer (shown in blue). •	Dual output mode, analog output more accurate. •	A fixed bolt hole for easy installation. •	Panel PCB Dimension: 30mm * 16mm. •	Soil Probe Dimension: 60mm*30mm. •	With power indicator (red) and digital switching output indicator (green).